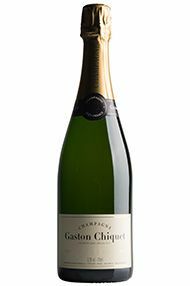 The Champagne grower-producer Gaston Chiquet has made a name for itself as one of the best. In a region with thousands of small producers, it is a credit to owners Antoine and Nicolas Chiquet. Based in the evocatively named Dizy, the family first planted vines in 1746 but did not produce Champagne until 1935, when brothers Ferdinand and Gaston Chiquet took the bold step of setting up their own label, rather than merely selling grapes to the larger houses. Today they produce 15,000 cases a year. This is a classic apéritif Champagne. Deliciously light, crisp citrus and apple orchard flavours mingle with sundry red-berried fruit. It is beautifully plumped out in the middle, courtesy of Premier Cru Pinot Noir fruit from the evocatively named village of Dizy, ending with delicate toasty notes. The Wine Advocate - Chiquets NV Brut Premier Cru Tradition is quite attractive and immediate. Dried pears, flowers, spices and mint all jump from the glass. The Tradition is an accessible, tasty Champagne to drink now and over the next few years. The Tradition is 45% Pinot Meunier, 35% Chardonnay and 20% Pinot Noir, based on the 2008 vintage, with reserve wines from 2005-2007. Disgorgement date: June 2012. Anticipated maturity: 2012-2016. Williams - Produced by farmers who used to sell all their grapes to the famous houses, grower Champagnes are increasingly, and deservedly, fashionable. Many of them remain (relatively) good-value, with Antoine and Nicolas Chiquet’s house non-vintage from the village of Dizy, with its super soft fizz and bright, taut apple fruit, a deliciously prime example. The champagne grower-producer Gaston Chiquet has made a name for itself as one of the best. In a region with thousands of small producers, it is a credit to owners Antoine and Nicolas Chiquet. Based in the evocatively named Dizy, the family first planted vines in 1746 but did not produce Champagne until 1935, when brothers Ferdinand and Gaston Chiquet took the bold step of setting up their own label, rather than merely selling grapes to the larger houses. With 22 hectares of vineyards in the great villages of Ay, Mareuil-sur-Ay and Hautvillers in the Vallee de la Marne area of central Champagne, they currently produce 15,000 cases each year, from a blend of 45% Pinot Meunier, 35% Chardonnay and 20% Pinot Noir.